Satterfield is centrally located, providing access to every amenity you could need. From exceptional healthcare facilities and hospitals to museums, entertainment venues, parks, golf courses, shopping, and dining, the Felton and Dover region has it all. The beach and other top Delaware destinations are just a short drive away! If your family is looking for a new home offering only the finest features and amenities, consider the beautiful new community of Satterfield in Felton, Delaware. Contact us today to experience the Satterfield difference! Intuitive Homes: We’ve tried to think of how people live in today’s homes. We’ve included things like; extra large master closets. Some models even offer TWO master closets. Walk up attics for extra storage, hobby rooms or the always sought after man cave! We’ve thought about the multi-generation families and have incorporated the ability to have 2 masters in some models to facilitate boomerang children or grandparents. We have well thought out ranch floor plans for today’s retirees too. Designed for Your Budget: The pricing on our homes is very affordable. We want to provide a product that is not only high quality, but also at a great price. We offer numerous floor plans to fit any budget and need. From the cozy Sussex to the sprawling Sebright, our homes allow ample room for your family. 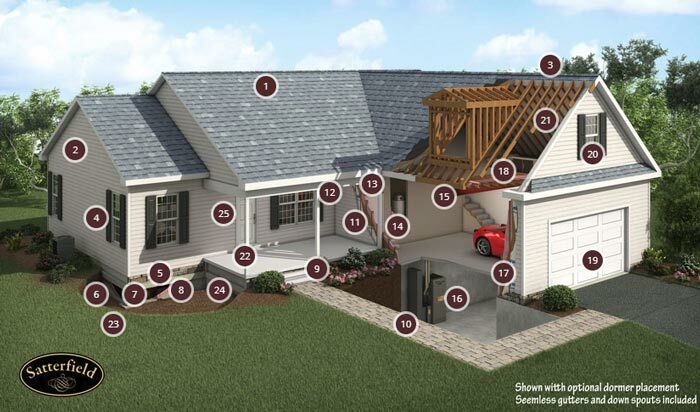 Whether you’re looking for a garage, a mudroom, or a covered porch, we have a floor plan designed to fit your needs. Looking for New Construction, But Don’t Want to Wait? See Satterfield Homes quick delivery models, new construction without the new construction wait. Our quick delivery models are built to showcase our best features, so you get your dream home without compromising on the features you want.